Bicycle rentals Plovdiv airport, bicycle hire Plovdiv airport. The most convenient and cost effective way to RENT A BICYCLE IN PLOVDIV AIRPORT, BULGARIA. We offer a wide range of bicycles for rent via Motoroads.com - mountain bikes, city bicycles, touring, racing, city, hybrid, ladies, electric and bicycles for kids. Our Plovdiv airport bicycle rental fleet in Bulgaria is built of reasonably priced new and used bicycles available at low rental rates. All kind of professional bicycle gear, accessories and equipment rental is available upon request in order to make your cycling adventure pleasant and safe. Being long in the cycle hire service, we know what you expect from us, and how to treat you. Bicycle rental in Plovdiv airport. Our rental fleet consists of ON-ROAD, XC [cross-country] or MTB [mountain] bicycles. 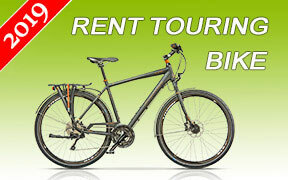 Booking online a bicycle for rent in Plovdiv airport is quite easy and takes a minute. If you wish we will deliver the bicycles to the place you stay in Plovdiv airport. Renting an on-road, cross-country or MTB bike is probably the best way to experience Plovdiv airport and Bulgaria. Upon bicycle collection, we will give you friendly road and map orientation. Plovdiv Airport is located 10 km southeast of Plovdiv on the main motorway to Assenovgrad. It can be easily accessed by road for 15-20 minutes, either via rental motorbike, car or taxi. Plovdiv airport is a main motorcycle hire gateway to many tourist destinations in southern Bulgaria. It is mainly specialized in servicing charter flights for the famous Bulgarian mountain ski resorts of Pamporovo and Borovets which are respectively 66 and 90 km away. To Pamporovo, it is 1 hour and 30 minutes drive southbound along route 86 through Asenovgrad, continuing to Chepelare, where after a right turn off route 86, the road will take you to Pamporovo. To reach Borovets by rental motorcycle (2 hours and 10 minutes drive), pick route 8/E80 after Plovdiv to Kostenets, turn left onto the E82 through Dolna Banya and continue to Borovets. Plovdiv airport is located 153 km from Bansko which is 3 hours and 15 minutes drive northbound on route 86 towards Plovdiv and continuing along route 8/E80 westbound to Belovo, where a southwest turn on route 84 through Yakoruda will lead you to Bansko. The proximity of Plovdiv airport to the capital of Bulgaria - Sofia (130 km or a 1,5 hour drive), makes it a vital alternative to Sofia airport in bad weather conditions. Currently, the main traffic is charter traffic to and from the United Kingdom, Ireland and Russia with about 30 airlines serving Plovdiv airport. Hiring a motorcycle or scooter at Plovdiv airport - in the heart of Bulgaria, gives you an excellent opportunity to explore the country whether you plan riding eastbound to the Black Sea resorts, to the capital westbound, or travelling across whole north Bulgaria, and even crossing borders and reaching south to Greece. Save time and money by instantly booking a motorcycle, scooter or bicycle online at Plovdiv Airport using the full motorbike, scooter and bicycle rental services of Motoroads at some of the most competitive rates and preferential rental conditions for all types of motorcycle, scooter or bicycle hire. Contact us for our bicycle rental services in Plovdiv airport.